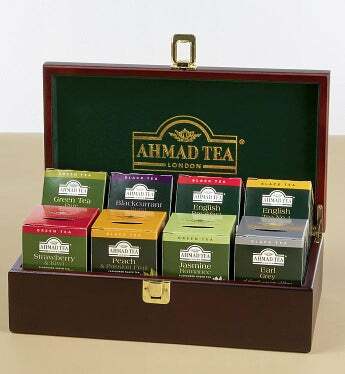 Ahmad Tea, 4th generation London tea purveyor, presents this handsome wood chest of classic teas. Each teabag is sealed in a foil pouch to retain flavor. The wood chest is lined in green velvet and compartmented so that the 80 teas can be beautifully displayed. The teas include English Breakfast, Jasmine, Black Currant, Green, Strawberry Kiwi, Peach and Passion Fruit, English Tea No. 1, and Earl Grey. 10 teabags of each flavor.